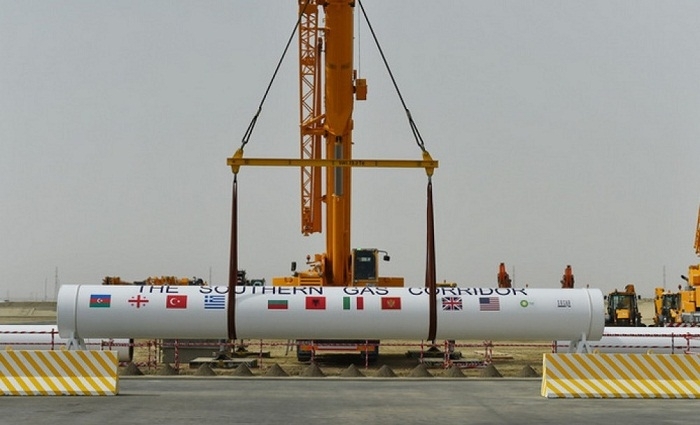 A new stage has begun in the implementation of the Southern Gas Corridor project, which envisages transportation of Azerbaijani gas to Europe, said Azerbaijan’s deputy energy minister Elnur Soltanov. He made the remarks during the meeting of energy ministers of Eastern Partnership countries in Bucharest, Romania on April 2, Azerbaijan’s Energy Ministry told Trend. Soltanov noted that the Trans-Adriatic Pipeline (TAP) project, which is the final leg of the Southern Gas Corridor, is more than 85 percent complete, and gas transportation within the second stage of development of the Azerbaijani Shah Deniz gas condensate field will begin in 2020. The deputy minister emphasized that with the launch of the Shah Deniz 2 project, the volume of natural gas exports to Turkey began to grow starting from the summer of 2018 and this process will continue. “The growing volumes of gas that will be exported to Turkey and in the future to Europe provide an opportunity for a proportional increase in the volumes of gas received by Georgia through the South Caucasus gas pipeline as a commission, and thereby increase Azerbaijan’s contribution to Georgia’s energy security,” Soltanov said. The deputy minister also noted the importance of continuing cooperation between the EU and the Eastern Partnership in diversifying sources and routes of energy supply. He further spoke about the cooperation between Azerbaijan, Turkey and Georgia in the field of electric power. He brought to the attention of the meeting participants that the cooperation in this field in the South Caucasus region doesn’t go beyond the cooperation between Azerbaijan and Georgia due to the occupation of Azerbaijani lands. The European Commission highly appreciated the success of Azerbaijan in the implementation of the Southern Gas Corridor project and noted the importance of cooperation between the EU and Eastern Partnership countries for accelerating and diversifying steps in this direction, the ministry said. The launching ceremony of the first stage of the Southern Gas Corridor was held in Baku on May 29, 2018, while opening ceremony of TANAP was held on June 12, 2018 in the Turkish city of Eskisehir.